Please refer to our stock # maya79JHX when inquiring. 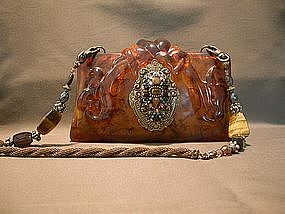 Maya used amber colored resin with graceful carved swirls in the creation of this purse. The oval medallion contains tiger eye, crystals and rhinestones. The antiqued bronzed metal chain has chunks of tiger eye, metal beads and faceted crystals. Purse is 8" wide, 4 1/2" high, and 1 3/4" deep. Chain is 44" end to end.